Citroën’s cars are famous for their comfort and it was along this insight the French car manufacturer decided to make traveling even more comfortable. 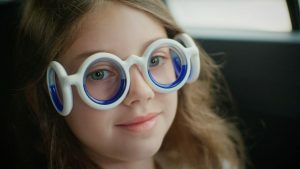 In partnership with its agency Traction (part of the BETC Group), Citroën introduces Seetroën, the first glasses against motion sickness. Motion sickness is a common condition that chronically affects more than30 million people in Europe. One in three develops symptoms at least once in a lifetime. Based on this observation, Traction and Citroën have created a unique object, which will initially be sold in limited and exclusive quantities, in the brand’s lifestyle boutique, available for pre-ordering from July 6. 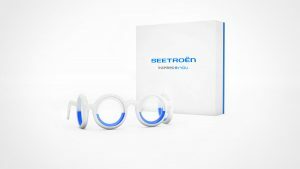 The Seetroën glasses use Boarding Ring technology: a patented and tested paramedical device, with a 95 per cent efficiency rate, developed by a French start-up. Motion sickness is due to a difference in perception between the sight and the sense of balance. Coloured liquid moves in rings arranged around the eyes, in the frontal direction (right-left), but also in the sagittal direction (front-back). This recreates an artificial horizon which re-synchronises the sight and the inner-ear and solves the motion sickness in less than 10 minutes and in 95%of the cases.